Yesterday marked the first day of rehearsal for Seattle Opera’s upcoming production of Rossini’s Barber of Seville, and as I sat in the room and listened to our singers run through the score, I realized something surprising: I can’t remember the last time I saw a comic opera on stage. Now, I haven’t seen as many operas as most of my colleagues, but I’d venture to say I’ve been to more than your average 24-year-old. Even so, when I tick through my list, nearly all I get is tragedy, pain, and death (usually of the leading lady, which is somewhat disheartening to this woman). But Barber is the complete opposite of that. There’s fun music, witty characters—including (hurrah!) a clever woman, Rosina—and a happy ending. It all sounds like just the feel-good therapy I need after crying like a baby at the end of Lucia di Lammermoor in October (oh, Edgardo...). And it seems like I’m not alone in needing a break. Italian opera audiences long ago felt the same way. It was during the eighteenth century, in the days of opera seria, that intermezzi—short, comedic interludes performed between acts of a serious Italian opera—began gaining in popularity, until composers started writing stand-alone comic operas in a genre that became known as opera buffa. The other Figaro story, Mozart’s Marriage of Figaro, is as beloved an opera buffa as Barber. We all can immediately recognize at least some of the lively and fast-paced music in Barber, including the famous overture and Figaro’s “Largo al factotum” aria (“Fi-ga-ro!”). Then there’s the core group of relatable and likable characters. 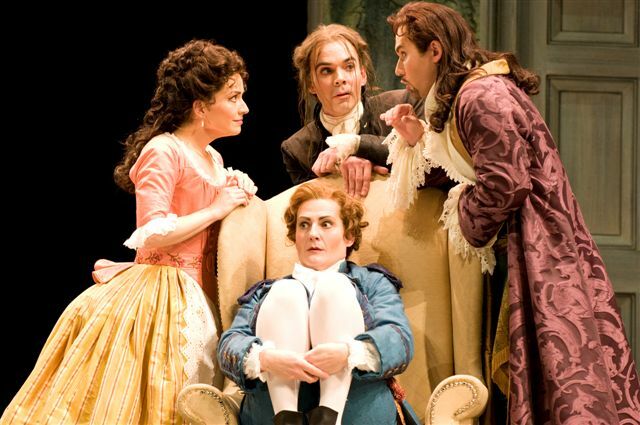 Who hasn’t known someone as cocky as Figaro, sassy as Rosina, or love-struck as Almaviva in real life? Hearing Carfizzi sing his tongue-twisting aria was akin to hearing Yakko here sing all the words in the dictionary—except that Carfizzi energetically powered through in a way that this little Animaniac couldn’t (though they both made it to the finish line, and were greeted with plenty of applause). We're now only a month away from the opening of The Barber of Seville and I'm already smiling at the thought of what's in store. What better way to start the new year than with a bunch of laughs and a playful outlook? In the meantime, keep an eye on this blog and our Facebook and Twitter pages for more on Barber as we look forward to January 15! Cute cartoon, for sure not the one I would expect for "Barber of Seville." I am going on Friday, the 21st with my subscription, and on Saturday, the 29th with some friends. I can hardly wait!